New products are always arriving, so please check back with constantly. Back view. The arrow shows the can opener..
Front: The Rock's drooling Brahma Bull with the words, "Laying' The Smack Down"
Brand New, Now Available in YOUTH Sizes! Visually, this is one of the best t-shirts that I have seen to date. 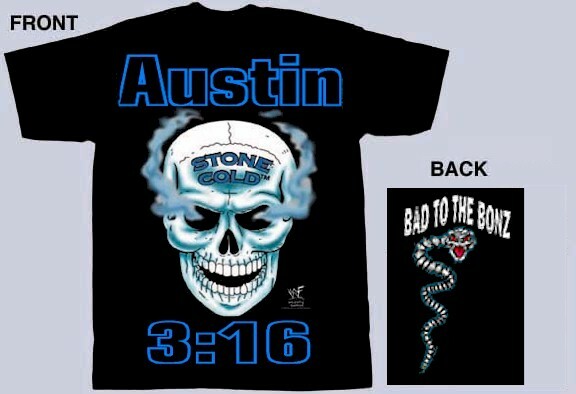 The t-shirt contains does not contain any vulgar verbiage or "Sign language", great for that young Austin fan. FRONT: A great cartoon of the Rock, giving the Eyebrow. 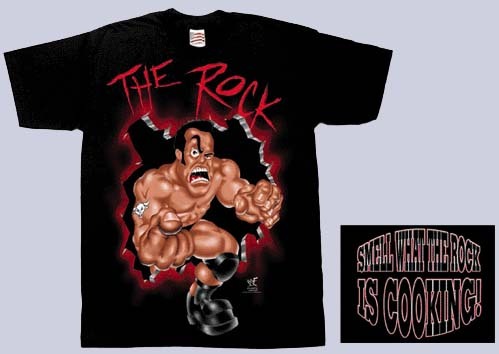 BACK: Says "Smell What The ROCK Is Cooking"